Happy Sunday all, I'm writing this post sipping on a hot chocolate whilst the sun is pouring through my window, bliss (however cold it is). In my Hello February post I mentioned this month my goal was to take more photos, whether it was with my camera or just snaps on Instagram - heres what I got up to this week and a few days before. Payday arrived so I decided to do a bit of shopping, oops. On my day off this week I treated myself and my parents to a coffee with a brownie, or two. I picked up some of the new Revlon Colourburst matte lip balms and I'm obsessed. Then we have my breakfast of choice this Sunday - granola and sliced banana with a sweet cup of tea. I also burned a new candle of mine this week, although I bought it a while ago its called Summer Scoop. Lastly I made a cheeky visit to Primark and picked up this little beauty of a bag. Another one of my favourite moments was going out for dinner with my best friend who was back from Uni this weekend, we opted for Mexican - yum! I was too busy scoffing my face and nattering to take a photo, oops. Hope you all had a lovely week, what have been your favourite moment? Happy Sunday! 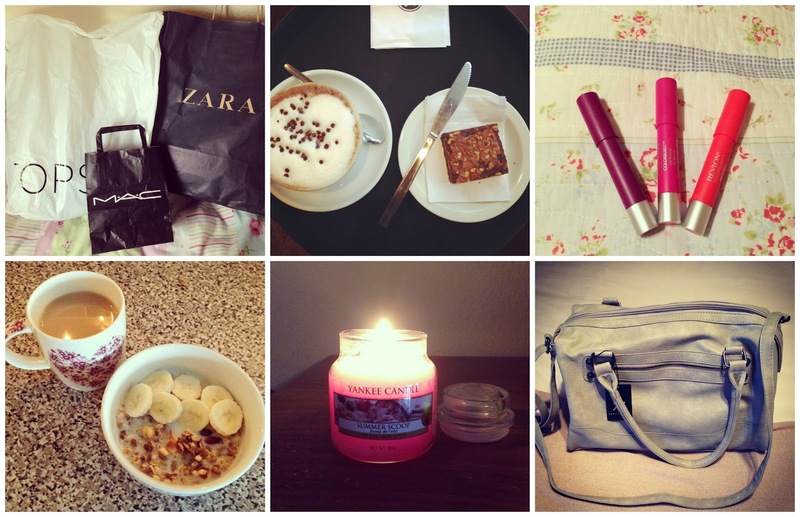 Lovely pics :) Jealous of your shopping spree!